Imagine having a suit with electronics woven into the fabric so that you can wear your watch on your sleeve. A solar-powered tent that allows you to charge your phone on camping trips. A chemical that could make oil spills in the ocean dissolve with no harm to the fish below. One day, such ideas might be more than imaginary. Thanks to research put forth by Clark School students, we're one step closer to the day when these ideas could become reality. 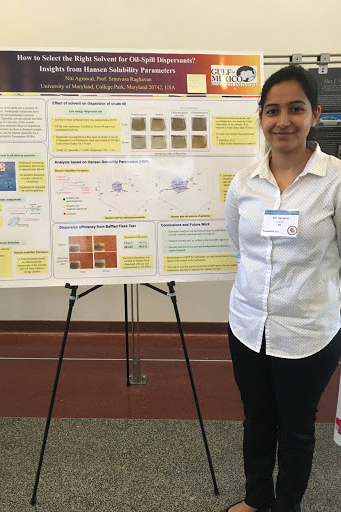 On Friday, June 2, engineering students from the Departments of Chemical and Biomolecular Engineering (ChBE) and Materials Science and Engineering (MSE) and the Fischell Department of Bioengineering (BIOE) presented their research at the Clark School's annual ResearchFest event. ResearchFest is a student-driven initiative, funded in part by the Graduate Student Activities Fee, to highlight the best undergraduate and graduate-level research from these three disciplines. Featuring guest judges, prizes, and a reception, ResearchFest allows students to share their work in a fun, casual setting with faculty, staff, and students from their own and other departments, as well as with students from across the University of Maryland campus. Each participating student delivered a one-minute PowerPoint presentation on his or her project before participating in a gallery-style poster session. In this way, this event allows for ChBE, MSE, and BIOE researchers to find overlaps and opportunities to collaborate on complex research with potential for significant, real-world application.